Whilst I was working through my 365 project, it struck me that when concluded, to continue to be useful as a resource potential explorers would need a way of interrogating the posts. From the outset I made sure each post outlining a Web2.0 tool was tagged appropriately – with both a SAMR level and a category (or more than one) stating the affordances of the tool. The tags could then be used to filter posts corresponding to the type of tool a viewer might be seeking. 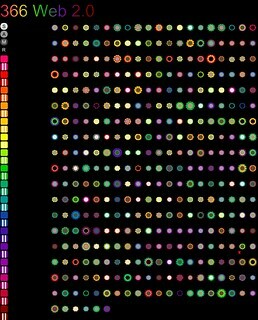 However none of that could provide a overview and summary of all 366 posts and tools; for that I’d been considering using an infographic of some sort. Right from the outset I’d had in my mind a graphic along the lines of the London underground map which had been morphed to use in other ways like Simon Patterson’s Great Bear which swapped the tube lines for fields or spheres of endeavour and the stations for people who were known in those spheres (like scientists, actors, authors etc), or Tubular Fells by Peter Burgess which used similar design principle to the Tube Map, but changed it to suit Lakeland Fells and walking routes. So in my version, Web Tube.0, the Web2.0 tools would be the stations, the categories of tools would be the lines and the SAMR categories become the zones. How hard could it be?! Given a planar graph G of maximum degree 8 with its embedding and vertex locations (e.g. the physical location of the tracks and stations of a metro system) and a set L of paths or cycles in G (e.g. metro lines) such that each edge of G belongs to at least one element of L, draw G and L nicely. We first specify the niceness of a drawing by listing a number of hard and soft constraints. Then we show that it is NP-complete to decide whether a drawing of G satisfying all hard constraints exists. In spite of the hardness of the problem we present a mixed-integer linear program (MIP) which always finds a drawing that fulfils all hard constraints (if such a drawing exists) and optimizes a weighted sum of costs corresponding to the soft constraints. We also describe some heuristics that speed up the MIP and we show how to include vertex labels in the drawing. 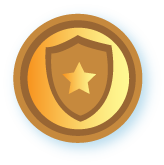 We have implemented the MIP, the heuristics and the vertex labelling. I wasn’t reassured when further investigation led me to an application called Context Free which “… is a program that generates images from written instructions called a grammar” Err, yes, well I certainly found an example in the gallery that might help – 24 stations on 3 lines with only 4 points of intersection (& of only 2 stations each) required in excess of 750 lines of code (albeit some blank spacers & others single characters)! It’s a simple alphabetic layout following the chronology of the posts and is only that shape for ease of viewing in its entirety; it could easily be a single row sweeping out an extended linear area … not so good for Web viewing perhaps? 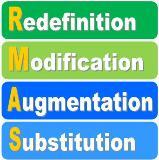 So at a glance the tools offering a particular SAMR level are easily identified. Finding tools in a particular category, for example concept mapping tools, requires a little deeper interrogation and perhaps at a higher zoom level. Whilst the colour coding helps here, some colours do tend to merge with their neighbours and are less easy to tell apart unless side-by-side. I designed and created it using Inkscape, an open source, freely downloadable vector graphics editor … which means the output can be scaled without the pixelation you get if using a bitmap editor like Photoshop or GIMP. In addition it provides another useful feature for those viewing the output svg file using certain browsers, namely the capacity to add interactivity to the image. So moving forward it’s my intention to make filtering the complete toolset down to just the ones you’re looking for with a single click – so clicking on ‘Survey’ for example will hide all tools except for the survey ones. I know it’s possible, but I suspect it will take a few more hours work … assuming the audience wants it?! Be grateful for your feedback. 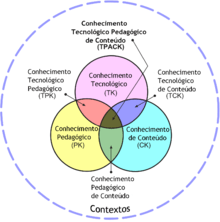 Posted by IaninSheffield in Inspiration, Tools, Web 2.0. As the New Year appears on the horizon, I watch people planning their 365 projects with a degree of envy, but a recognition that I’d be unlikely to sustain a photo a day for a whole year. I’d probably run out of steam or inspiration long before even January drew to a close. And yet I still have a hankering to undertake a serious year-long project. But who says 365 projects have to be about photography? Might it be possible to have a crack at a 365 project with a completely different theme? Well for my 365 project, I make the rules and I decided the answer would be ‘Yes’ … and the theme would be Web 2.0 tools. Given the thousands that are out there, how hard can it possibly be to find just 365? Well OK, it is a leap year, so that’s just made it a little bit harder, but I’ll live with that. Rather than just picking tools at random, I’ve already done the hard work of searching out the ones I thought might best suit our learning/school-based needs. You might like to speculate which ones made the cut. I first thought I might present them thematically; a week of presentation tools, then a week of something else. But in the end decided to add a little frisson of anticipation by simply launching them alphabetically! I’ll still be tagging them thematically however, so as the year progresses (assuming and hoping I have the stamina! ), viewers will be able to filter those of particular interest. Adding a few lines of descriptive or explanatory text would have been a little too easy, so since I’m less at ease in the oral medium, I’ve opted to push myself a little harder by producing a mini-podcast outlining what each tool offers. With that in mind, I also wanted to add one more layer to each post, in which I would offer a notional idea of the level of demand or learning complexity of each tool. At first I considered trying to assign each tool to a particular level on Bloom’s taxonomy, but that just didn’t seem right; I felt the level on Bloom’s is more related to the task being undertaken than the tool being used. As Silvia Tolisano observed with iPad apps, tools can be used in different ways at different times, so a tool’s position is likely to be somewhat fluid. 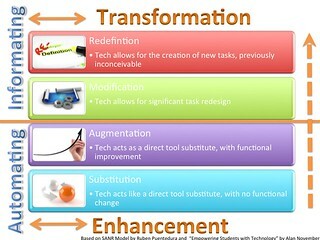 In the end, having recently begun to read more about Ruben Puentedura’s SAMR model, it seemed to lend itself more closely to how I wanted to classify the different tools. Moreover, regular inspection and application of a framework is surely more likely to lead to greater understanding? Assuming that each tool could work at least the ‘Substitution’ level, my task then would be to establish what further affordances might enable it to work at higher levels. So for each tool, I’ll offer a tentative level, but hope that folks might challenge my thinking, suggesting how they think a particular tool works at a different level. Given that each daily post will mash together different resources, Posterous seemed the easiest tool to facilitate that, so you’ll find it’s all happening at 366 Web 2.0 Tools … well, OK not quite yet, but at least there’s a page of introduction and links to some of the sources I drew on. Roll on January 1st!